Another favorite this week. Such beautiful clothes at Brian Reyes. From the Brian Reyes Fall 2010 collection. See all the looks on style.com. Ahh this entire collection was so beautiful, he designs such fresh, feminine clothes. I love this collection. What great patterns he has! 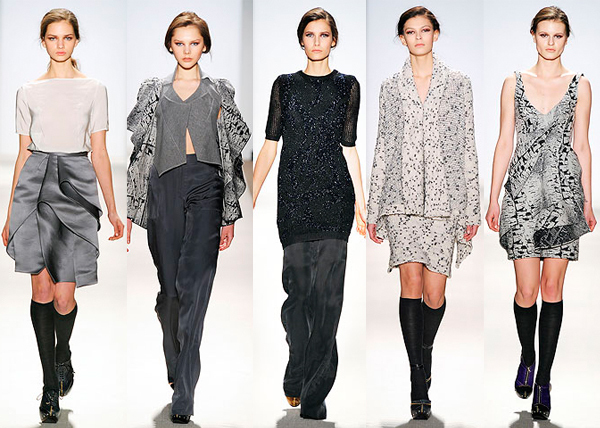 LOVED the jewel colors and grays at Brian Reyes! I can’t wait to own a pair of the high-waist silk shorts with the leggings! so beautiful! I loved the deep jewels tones, stunning! Heavy fur jackets and soft fine silks, perfect mixtures! I loved this collection. The easy flowing pants along with the grey skirt on the left may be my favorite pieces of the collection. The furs were also amazing!! loved all the different textures that were used. love the use of pants.. definitely my favorite.